to do rock and roll more than I wanted to do theater." A few months back, a man who calls himself Meat Loaf walked into the Lone Star cafe in Manhattan. On the stage were members of Slewfoot, Toby Bo, a Broadway singer named Rhonda, and Johnny and Edgar Winter. Now Meat Loaf, who may be better know to some as Eddie of The Rocky Horror Picture Show, is not a timid man. He hoisted his ample frame onto the stage and ambled over to fellow Texan Edgar, who, being extremely nearsighted, turned to a friend and said, "Who is it?" Only Edgar Winter could have asked the question, because Meat Loaf is not someone easily missed. Not only for his massive physical size, but also for his massive voice. That voice was most recently heard on Ted Nugent's Free For All, but has also accompanied its owner in a long series of rock musicals, including Hair and the National Lampoon Show. None of these vehicles, memorable as some of them were, was quite able to support the prodigious Mr. Loaf. There was nothing BIG enough. Until he met a composer named Jim Steinman. Steinman is as small and quiet as Meat Loaf is large and loud. But his musical fantasies are nothing short of epic, as anyone who takes the 9:44 it requires to listen to Bat Out Of Hell will readily discover. The title cut of Meat Loaf's debut on Cleveland International/Epic is a blockbuster sci-fi thriller about a mutant biker who rides out of the pit of Hell. "I've always been fascinated by the supernatural," Steinman says. "And I always felt that rock was the perfect idiom for it." When he began working with Meat Loaf several years ago, Steinman realized he had found the ideal voice for his highly romantic songs. "It's difficult because I wanted someone with an operatic kind of intensity, but obviously I didn't want an opera singer. I wanted a hard rocker." 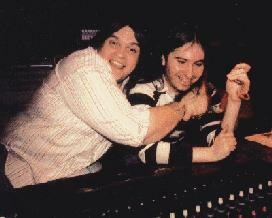 After a few remarkable performances Meat Loaf and Steinman started searching for a producer. "We had been working in a rehearsal studio, and Moogy Klingman started coming by quite a bit. One day he brought Todd Rundgren down to hear us, and Todd listened and said 'Let's do it.'" A very fortunate accident: Todd's interest was pivotal in the creation of Bat Out Of Hell. Not only was he the perfect producer for Steinman's grand designs, he was also the essential guitarist, long admired by Meat Loaf and Steinman both. "We knew pretty clearly what we wanted," Meat Loaf said, "But Todd works so fast that sometimes it seemed as though he was reading our minds. He would say, 'Do you want backups on this?' and we would say 'Yes,' and he would step into a corner for a few minutes, and return with parts for everybody, perfectly matched to the music." The album also features Max Weinberg and Roy Bittan, from the E Street Band, and for a sizzling few minutes, the myopic Mr. Winter on saxophone. With Heavy Metal artist Richard Corben's incendiary cover illustration, and Meat Loaf's blistering vocals belting over three octaves, Steinman's Wagnerian rock may well start fires that will be hard to put out.